Rules are tricky for little kids. It’s not that they set out to be “anti-establishment,” in fact many experts tout how much they crave guidelines, there is just a LOT to remember and SO many temptations! Museums easily fall into that list of “a lot to remember” and “interesting temptations” with so much stuff that looks so fun to touch. Admit it, you’ve seen as many adults behaving badly as you have young kids! To try and help out, well meaning museum professionals put together rules. These rules make sense, they are there to protect the objects and make sure everyone can enjoy the space. Unfortunately, that isn’t how they always come off. For people who are already nervous about visiting the museum it just feels like a long list of ways they are going to “mess up” and “get in trouble.” For parents with young kids, it is a list that goes against all of the innate tendencies of kids (touching things, getting excited, moving at high velocities). So, what can you do? I think there is a middle ground if you think back through your rules through the eyes of the visitor. Calm Walking Feet: Pretty self-explanatory. The playground was for running, the museum was for walking. Simple right? These rules cut right to the chase and helped kids meet the most important expectations of the museum. The best part was, because they had a name (Museum Manners) you could reference them and not have to chastise a child personally. Very nice to say “Oh! 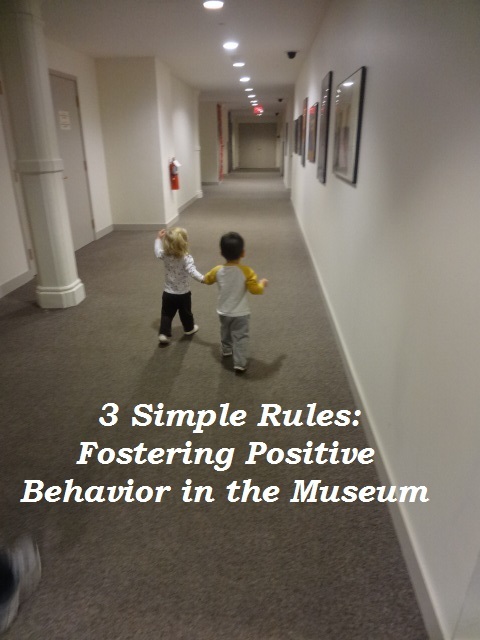 Are those your Museum Manners?” rather then “No Running!” Based on the expectations of your space you can tweak the wording and even replace a rule with one of your own. Starting each program with a review of your 3 rules, having them printed at your info desk and training your staff to use them will help them become a part of your museum’s culture. Bonus, it is easy for parents to adopt and use on their own and you can give the outline to teacher’s in advance for them to practice before coming. 3. Reassure people (kids and adults). Tell them you are glad they are excited to be there. Smile when a kid shouts out in excitement, act sympathetic if a baby is crying. Get them on your side by enlisting their help in protecting the objects and following the rules. Compare your space to a library and remind them they probably know what to expect there and it is very similar here. Basically, make sure they know you are glad they are there! I’ve been to a few museums where I walked away feeling like the staff and volunteers really wished the visitors wouldn’t come. This is not the feeling you want to give! Another important thing, make sure your staff knows that children are people too and that they are welcome in your space. This isn’t just for your front-line staff. EVERYONE who might come in contact with a visitor should know what is expected and how to help guide them. It does you no favors if you are welcoming to adult visitors but give an icy reception to children. They take notice, and won’t give your space respect. Their parents take notice, and won’t come back. This entry was posted in Blog, Early Childhood Education, Kids in Museums, Museum Education and tagged museum professionals, museums with kids, preschool, Smithsonian Early Enrichment Center, teachable moments, toddler. Bookmark the permalink. Great perspective! I love how you say “Create opportunities to say yes” I think that is so important for kids!